Our Velvety Mushroom Stroganoff is hearty on its own, but if you’d like something heavier, you’ll find this recipe simple and thoroughly satisfying! Place cooked rice on the side of a plate. Heat up Velvety Mushroom Stroganoff till bubbling. 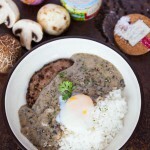 Place the pan-fried beef and the soft boiled egg on the side of the rice. 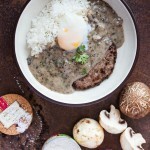 Pour the Velvety Mushroom Stroganoff over the side of the rice. Garnish with freshly chopped parsley. Enjoy your hearty meal!